Barnes & Noble Vespa End Cap! Thanks to Greg W. for this heads up. 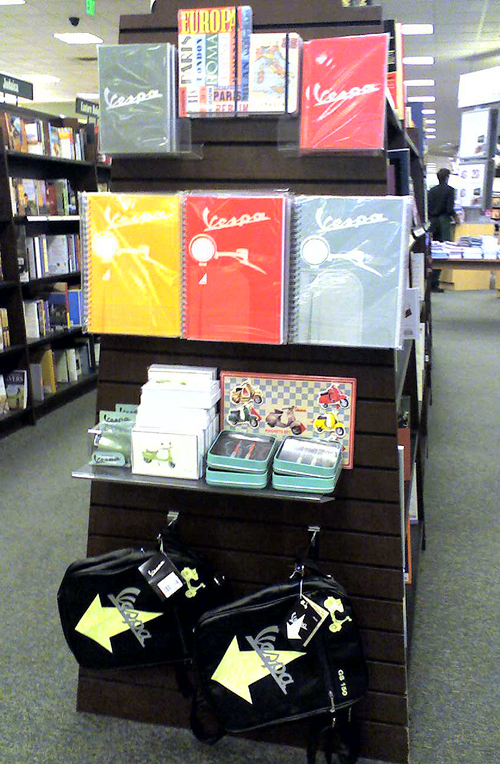 Barnes and Noble stores currently have Vespa end cap displays with journals, pens, bags, magnets, notecards, and even a cute fender headlight alarm clock! Only the notecards seem to be available on their site though so a store visit is a must. It looks like not all B&N stores have the Vespa merchandise. I was in the B&N in the Lloyd Center Mall in Portland, Oregon. This entry was posted in Bags, Books, Miscellaneous, Stationery by Tracy. Bookmark the permalink. I was in Portland, Oregon at the Lloyd Center Mall. not at the Barnes and Nobles in Indianapolis! I’dlove to have one of these clocks!